The Finch is the perfect marriage of two outstanding drivers, the Morel CAT378 with a vintage Vifa 6.5″ Premium Line PL18WO-09-08 midwoofer. In my earlier attempts with the PL18, I wasn’t too pleased with the results. But that’s through no fault of the PL18. It was the Vifa PL27TG35 Premium Line tweeter that I was unhappy with. Baffle diffraction was creating havoc with the tweeter’s response. To cut a long story short, I ended up with a 4th order network to get the sound I was after. The crossover cost was horrendous. I said to myself, there must be an easier and cheaper way. The PL18s were eventually packed and stayed in storage for the next 10 years. (13 Liters Bass Reflex, Baffle Width=8.5″) Fig 1 – Vifa PL18WO-09-08 RAW Frequency Response. Mic on axis, Impulse Window 5ms, No smoothing. Now that I’ve found the right tweeter for the PL18, I took it out of storage and did a Frequency sweep. The PL18 response in Fig 1 is still as beautiful as ever. Completely flat with a roll-off to die for. She’s becking for a 1st order crossover. (13 Liters Bass Reflex, Baffle Width=8.5″) Fig 2 – Morel CAT378 RAW Frequency Response. Mic on CAT 378 axis. Impulse Window 5ms, No smoothing. Fig 2 is the response of the Morel CAT378 without any crossover. Note the smoothness of the response. No jaggedness anywhere. Bear in mind that this response is with the tweeter mounted in a 13 liters box with a baffle width of 8.5″. As can be seen, the destructive effects of baffle diffraction is completely absent. (1st order network) Fig 3 – 1st order response of PL18WO-09-08 with Morel CAT 378. Mic on CAT 378 axis. Impulse Window 5ms, No smoothing. Fig 3 shows the PL18 (Blue) and the CAT378 (Red) with a 1st order network. The Black plot is the summed response. For clarity, the final frequency response of the Finch is show in Fig 4. (1st order network) Fig 4 – Summed Response of Vifa PL18WO-09-08 with Morel CAT 378. Mic on CAT 378 axis. Impulse Window 5ms, No smoothing. This is what I call an elegant design. One inductor for the woofer, one capacitor for the tweeter. There are other components to correct the response but essentially, it’s a 1st order network. The flatness is amazing. I have dreamt of doing this for ages. Just haven’t found the right tweeter. I could have used a compression driver with a horn but I wanted to use a hifi tweeter. I took a chance on the CAT378 and through enough, she is perfect. Fig 5 is the Waterfall plot of the Finch (courtesy of REW). Time Range is 1.0ms, so this is a highly magnified view. The treble is generally very clean. Finch Toneburst Energy Storage (TES) Fig 6 – Finch TES. Impulse Window = 5ms. Mic on Cat 378 axis. 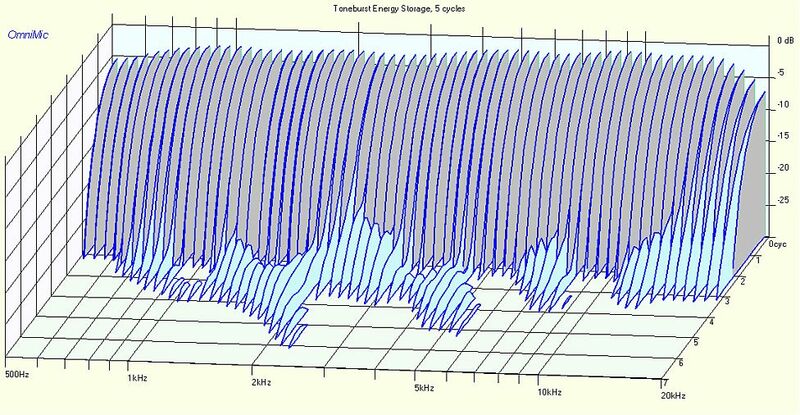 Fig 6 shows the Toneburst Energy Storage of the Finch. 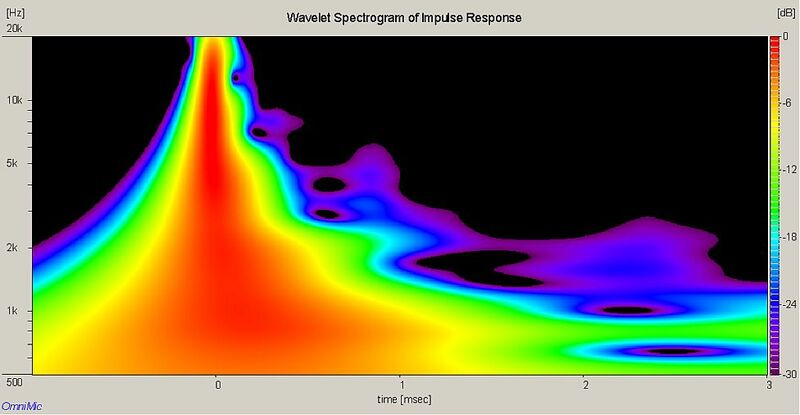 There is a tiny bit of excess energy at 2kHz (the light Blue slices). There is an indication of this in the waterfall in Fig 5. The Finch Spectrogram in Fig 7 shows the excess energy at 2kHz. In a 3ms window, it is about -30dB. This will not contribute to time smearing on playback. The Finch Harmonic Distortion is shown in Fig 8. 2nd and 3rd harmonics are about -60dB below the fundamental. More importantly, there are no anomaly from 500Hz to 10kHz. Measurements below 500Hz should be disregarded as my room is interfering with the sweep. The Finch is an extraordinarily likable speaker. The mids are transparent without being “in your face”. Acoustic and classical guitars sound wonderful in particular. When Craig Chaquico’s Acoustic Highway came on, it transported me to another dimension. Another album I enjoy listening to is Yoshio Kimura Audiophile Selections. I find the mellowness of nylon strings soothing. In the upper treble region, the Morel CAT378 is outstanding, even on 1st order. She has the right kind of timbre. She can produce metal strings realistically without sounding metallic, if you know what I mean. Where the Finch really stands out is in the bass. The Vifa PL18 has this uncanny ability to do both midbass and lower bass. Because of this, the bass sounds exceedingly natural. None of my midwoofers, from 5.25 to 7″, can do this. It’s a pity that this PL18WO-09-08 is no longer manufactured. If you can find a pair, I suggest you grab them. You won’t regret it.